The Nautilus Inn "Is" Daytona Beach! From the moment you arrive at our famous "A1A" location you'll feel like you're on vacation. Step into our tropical paradise from one of our contemporary beachfront hotel rooms or stroll down along the water's edge and become a part of our renowned beach scenery. We promise you will experience the finest qualities of a Florida beach vacation while enjoying your stay at the Nautilus Inn. Your satisfaction is paramount at the Nautilus Inn. The Nautilus Inn offers Daytona's highest standard in hotel customer service as well as impeccable housekeeping and contemporary services and amenities. 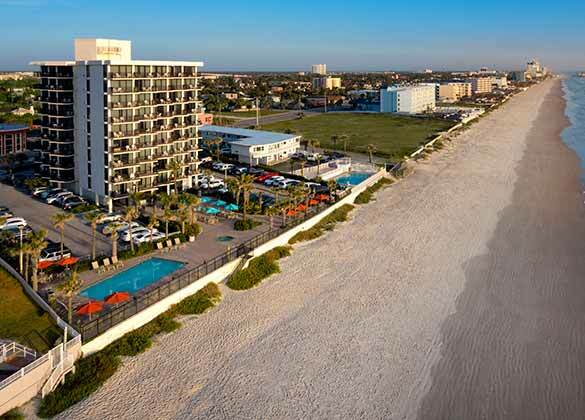 You'll find the Nautilus Inn offers the best Daytona Beach location to soak up the Florida sunshine from our ocean-front sundeck with heated pool, chaise lounges and whirlpool. Plus, all of our rates include complimentary daily deluxe breakfast and cocktail hour! Check out our selection of Daytona Beach hotel rooms, best-in-class Florida vacation values and exciting options for vacation fun! You'll quickly come to understand why the Nautilus Inn is a 2016 Tripadvisor Certificate of Excellence award winner and consistently one of Tripadvisor's top ten hotels in Daytona Beach.